Plenty of us love a good war or military strategy film. Not necessarily because we love the violence of war, but because it gives us a sense of what it’s like to be there without being there. The danger, heroism and moral dilemmas soldiers face in the field is incredible and in many ways can be a metaphor for the battle of every day life. Triple Frontier uses all the action sequences we are drawn to in those films to have a deeper conversation about the motivations of its characters to take on a deadly mission in hopes of a final payoff after years of service to their country. 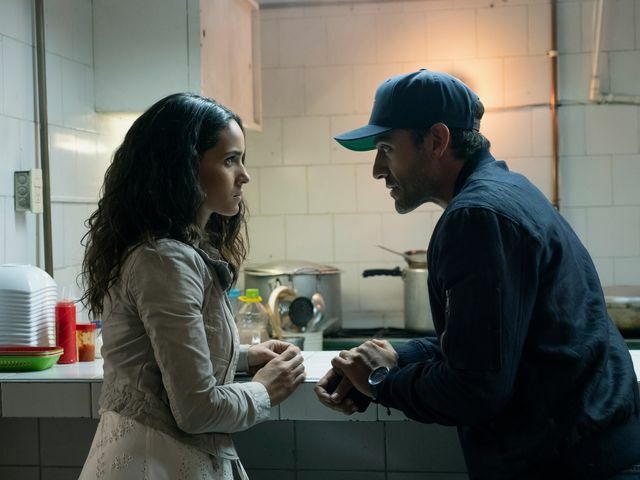 The film starts out in typical narrative by giving us a glimpse at Santiago “Pope” Garcia’s (Oscar Isaac) current assignment chasing down a cartel leader in South America. Eluding him for years, Pope has an informant that not only knows where Lorea is, but that the multi-millions of dollars in cash that he has amassed is in the house with him. Director J.C. Chandor gives us the recruitment sequences but jumps to the parts we need to see and know. He doesn’t spend time showing Pope on a flight to the U.S. and looking through folders with files. Instead, Pope shows up in an ongoing chat that has been cut in between Pope’s backstory with William “Ironhead” Miller (Charlie Hunnam), who is now giving speeches to current soldiers transitioning to private sector life. He finds Ironhead’s brother, Ben Miller (Garrett Hedlund), at an MMA fight. The fight is a good excuse to round up the entire crew. Tom “Redfly” Davis (Ben Affleck) is the retired brains who understands how to carry out an attack to the minute, and Francisco “Catfish” Morales (Pedro Pascal) is their helicopter pilot. Once the team is in place, the recon proves the mission could be more of a suicide attempt than they had expected. It’s after the action occurs (reminiscent of an 80’s Schwarzenegger or Chuck Norris flick) that we still have half of the running time left to go in the movie. It’s in the space of their retreat that they find themselves up against the wall with moral and survival dilemmas. This film feels very old school in it’s handling of action, but new in the conversations it brings to the table. The toll of war is evident on each character’s face as well as in their decision making. Whether they make a decision to kill, compartmentalize what has been done due to the rationalization of the situation, or tuck the guilt in their pocket momentarily to push through, the weight is obvious. What is the impact of taking someone’s life? Does one life outweigh another? What do our veterans have to show for their efforts after years of service? These are questions that screenwriters J.C. Chandor and Mark Boal try to wrestle with throughout the film. This is a solid tactical shoot ‘em up with just enough heart to make it stand out for a flick for the guys (it’s definitely a bro movie). Proving that direct to streaming is a viable option these days, Triple Frontier is a good watch for your Netflix perusing.